Dennis Swanepoel of WearCheck’s reliability solutions division in Johannesburg was invited to present two papers to delegates in Antwerp, Belgium, who were attending the latest IMVAC (International Machine Vibration Analysis and Condition Monitoring Conference) this month. Dennis’s first paper, titled ‘Tried and Tested Tube Mill Monitoring’, focused on tube mills used for coal milling in the power generation industry. In a mill, the drive train typically consists of a motor (>2MW), a gearbox (>8ton) and a girth gear(>7meter), all driving a tube mill with a >70ton ball load. Power generation losses typically amount to 135MW if the mill is shut down unexpectedly. With more than 10 years of experience in the field of tube milling applications, Dennis was able to discuss various special methods in the fields of oil analysis, vibration analysis, advanced signal processing, operational deflection shape analysis, thermal analysis and operational visual inspections. Paper two was called ‘Is Video Amplification Real?’ The analysis of two case studies was discussed, where video amplification was used, and this data was then compared to traditional operational deflection shape analysis. Examining the two cases, a correlation between the two technologies was evident, and the different merits of each technology was discussed. 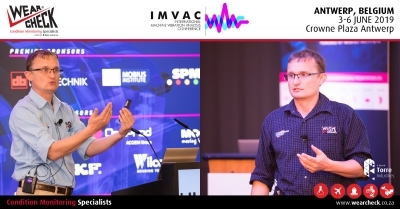 Caption: Dennis Swanepoel of WearCheck’s reliability solutions division was invited to present two papers to delegates at IMVAC in Belgium last week.